What is the definition of Condensity High Density Mobile System? Condensity High Density Mobile System is a new storage solution designed to save time, space, and money. 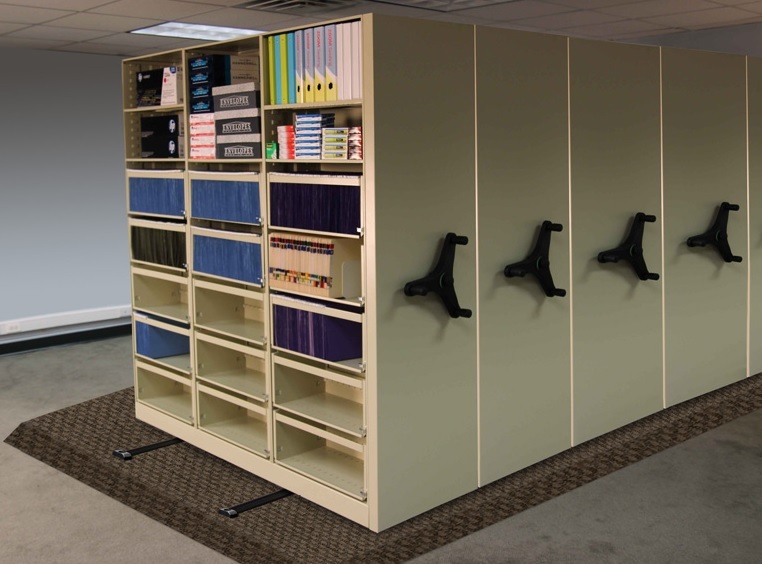 It combines the best of high density mobile storage and the rotating shelving solution. This really comes into play when you are thinking of a high density storage solution with drawers. Condensity high density mobile system when drawers are being used is best solution for the price. This is the perfect solution for an office that wants to keep with top tab filing and needs to store it into a smaller area. High density mobile system put a lot of storage into a small area. Rotating shelving is a unique because of the many different storage solution it can offer. It can store Top Tab Files, End Tab Files, Binders, Small Media and Wardrobes. Condensity conforms to Anti-Tip industry safety standards. Times Two will handle all of your hanging folder requirements. Drawers can be stacked 1 per tier for complete hanging folder storage. Drawer front and back are slotted every 1/2 inch for adjustability. Drawer divider runs the full depth. Adjustable slotted drawers allow for easy storage of CD’s, videotapes, microfilm, microfiche, index cards or checks. Our most popular acce-ssory. The 5-, 6-, 7-, and 8- tier models accept the Rollout Reference Shelf with no loss of filing inches when used with standard shelves. Confidential documents stay safe and secure. The drawer features double key lock and recessed drawer front.